This 9v9 Goal post is the Football Association recommended size for 9 v 9 Youth Football. The multi-surface football goal measures 4.8M x 2.1M (16’x7′) and is made from lightweight but strong 70mm diameter aluminum tube. The goal uses strengthened industrial nylon connectors that make the goalpost Strong, sturdy, quick to install and dismantle. The side frames of the assembled goalpost can be left together with the net attached, and on match days they pull apart to allow the crossbar and back ground bar to be locked in place.The goal has quick fit ‘Arrow Head Net hooks’ that allow neat and rapid fixing of nets to the rear of the posts. 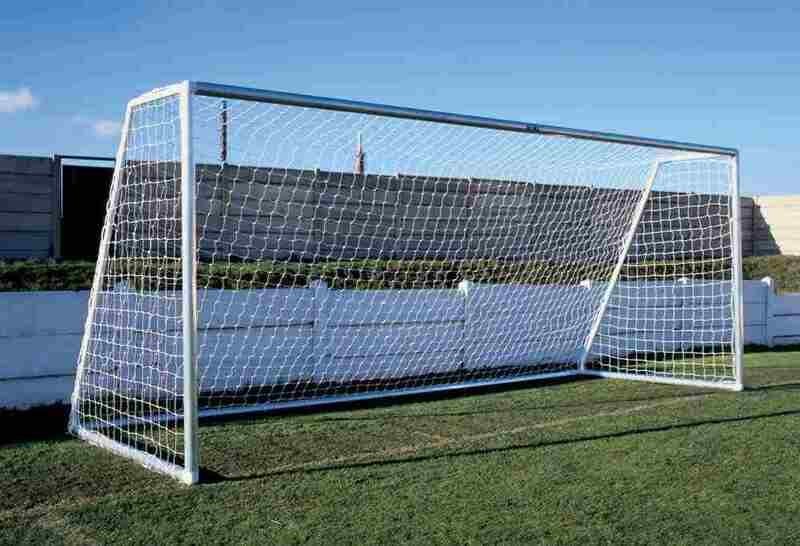 No need for untidy and time consuming net clips that pull nets around front of posts.This football goal is ideal for matches or training, it has a top quality long lasting net and straight crossbars that ,unlike uPVC youth goals, they give the correct rebound. 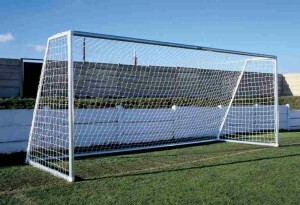 This goalpost can be supplied in mill finish aluminium or powder coated white as shown below. A superior top quality value for money British product that has extensive manufacturers warranty is functional, easy to use, competitively priced and can fold flat for storage. Each goal frame weighs approximately 25 Kg and is much safer to use with young children than the heavy steel freestanding goalposts. ● Football Association recommended football goal size for small sided 9 v 9 football. Can be supplied in Powder coated white finish or if the club is working to a budget aluminium mill finish as the image shows. A Superior British product Made in Sheffield, easy and safe to use, competitively priced and with an unmatched manufacturers warranty. The best on line price for this Flat Pack Football Goal 16×7 is currently at www.soccertackle.com. Many thanks your for help and flexibility on this order. I really appreciate it. I’ll make sure my husband knows about your policy of shredding all sales credit card documentation. Your goal certainly looks materially better than the Samba one we currently have. The demountable aluminum flat pack goal is without doubt the best 16’x7’ goalpost available anywhere solid strong and so much better than Samba Goals that have a huge crossbar dip. We no longer use plastic goals and these are well worth the extra for the straight crossbar alone. The rebound is true and not like the Samba plastic crossbar that seems to have a deadening affect on the ball as it hits the crossbar and the football does not rebound as it should. This ITSA GOAL aluminum 9v9 goal is real value for money…great fun we play with it all the time and recommend it to any one…. a great product that actually looks like and performs like a proper goal.